Specifically designed for the "peeling" required to dig coral rock. 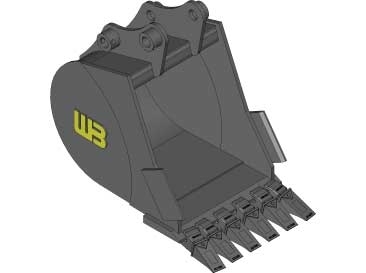 These buckets can also be used in other applications such as demolition work, highly abrasive applications, shot rock, and moderate prying. High strength, wear resistant steel is utilized in all critical and high wear components. The cutting edge is backed by a wear plate that covers the entire bucket bottom. Side wear plates protect the bucket sides. Each bucket is engineered with tapered side plates to reduce wear on the buckets sides, and to allow for easier dumping. The cutting edge on this bucket is designed with additional thickness. The cutting edge is protected by an increased number of smaller teeth. A variety of high quality brand teeth are available to choose from. .78 cu. ft. to 17.1 cu. ft. of various widths are available. Side cutters are optional for additional side clearance. 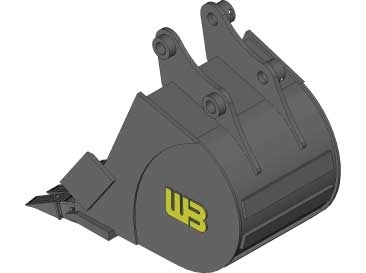 Box rippers are available for this bucket and can be installed upon request. Special designs and capacities are available. 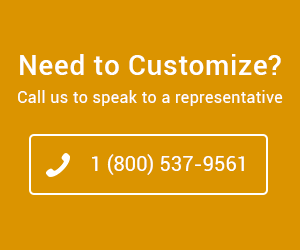 Please request a quote from a Dealer or contact Werk-Brau directly.